The TRUTH has shared some old pm’s from inside the Kimpire. They a disturbing to say the least. Heidi once again proves what a complete unqualified person she is. Search any pro-ana site and you will find the very same comments being shared. 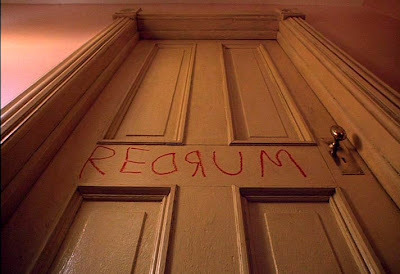 The thing with the laxatives. You have to put something in to get something out. This is the Heidi that got me involved in this. I started to do a complete rundown on what is wrong with her posts. Decided to do the condensed version instead. HEIDI IS NOT QUALIFIED TO GIVE ADVICE. SHE DOESN’T KNOW WHAT THE HELL SHE IS TALKING ABOUT. NEVER BELIEVE ANYTHING SHE POSTS. As par for the course she is spreading her brand of nutritional knowledge. Not that any of it is true. I don’t want to get into all the untruths in the above statements. I would just like to address the points on WLS. Are you ready for a little WLS 101??? She points out the lady only eats 2 onces of protein and if she is still hungry she will eat the veggies. There is a good reason for only eating such a small portion. YOUR FRIGGIN’ STOMACH IS NOW ONLY THE SIZE OF AN EGG!!! The graphic above gives you an idea of several types of WLS. In all of them the “pouch” is restricted to hold only a very few ounces at a time. This makes it where you are forced to limit your portion sizes. One bite too much and you have the wonderful effect of puking everything back up. As for the lady who lost 120+ pounds, I would like to know how far out she is. In WLS speak that means how long it’s been since her surgery. Most people do grand for the first few years. The farther out they are the more weight they have gained and more complications they have had. But this post is not about debating the pros and cons of WLS. Wander over to my personal blog to get my views on that. This is about Heidi continuing to use the WLS life as an argument for how great her plan is. I’ve addressed this many times over the course of these past months. 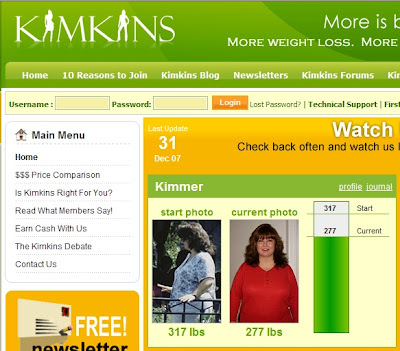 When comparing Kimkins vs WLS, that’s like comparing apples and oranges. Yes, one of the points of WLS is restriction of calories. By using restrictive procedures such as the lap band and restrictive/malabsorptive procedures such as the RNY. BUT……this is where Heidi fails…. You know, those people with a whole string of letters behind their name….like MD, PhD, RN, CRRN, RD, etc….someone who is actually QUALIFIED to be giving advice. In my case alone these are the MEDICAL PROFESSIONALS I saw on a routine basis for 2 solid years and am still followed regularly by most of them. What does Kimkins offer…..a “bored housewife” with a computer and too much time on her hands. Why Is Kimmer Off the Front Page? In the latest episode of “As the Kimmer Turns“, Heidi has removed herself from the front page. No more watch us lose for her. 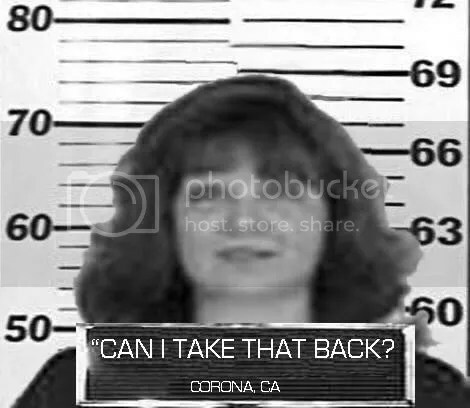 Since she’s not losing anyway…..
anyway….the members wanted to know why….she didn’t get snarky about it this time….here is her response….straight from them Kimpound. We wanted to give others an opportunity to share their progress and they’re spectacular! My biggest “thanks” to everyone who is, or has, volunteered their progress with the world. Instead, I’ve added my start and progress pics in my siggy (XXXXXX, I did it, LOL!) The last photo is when I weighed about 180 and I’ll be happy to get back there. Yes, it was long ago so no Disco Hair comments! This is her pic in her sig line now…. I mean, come on, seriously folks…..do we actually believe this may be a real pic of Heidi??? 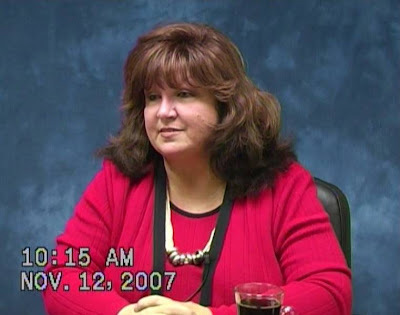 Kimmer is a Big-Boned, Diabolical, Quasi-Diabetic, Lint Licking, Lying, Liar that Lies. I seriously doubt the authenticity of any pic she shows. Here’s the pic I’m looking forward to…..
With all the sad news of continued support of low calorie starvation eating at Kimkins. We already know how nutritionally bankrupt the diet is. But is it a diet or an eating disorder? I thought you might like to revisit what Heidi feels about ED. We are low calorie after ketosis kicks in or with the shake option, but those calories are identical to post-WLS patients (500 cal a day for months), original Optifast and Medifast (450-700 cal a day for months). SHE HAS NO LICENSE TO PRACTICE MEDICINE. The same applies to the Medifast or other liquid diets. You are supervised very closely by a doctor. Not some woman sitting behind a computer screen on a big power trip. I don’t think we can fight the “1200 calorie a day mentality”. Some people cannot understand that your body takes the calories it needs from body fat if the calories you eat are too low to sustain current weight. If you need 2500 calories (250 lb person) and eat 500 (number picked for easy math), the other 2000 are taken from body fat. This is just stupid. Elle did a good job of debunking this myth. In Jimmy’s interview I meant what I said about take a Weight Watcher or Jenny Craig meal and remove the starches. What’s left? Kimkins. There is no health advantage to adding carbs or extra fat, so why is removing them (and having less calories) dangerous? 1200 calories a day is an arbitrary number (like 8 glasses of water). Anorexia is a psychological disorder. Do we have people with ED on Kimkins? Of course. I weighed 318 pounds and you don’t get that big without an improper relationship with food so I have an ED. But low calories aren’t an ED, otherwise all of the WLS patients would be medically classified anorexic. What if regular Kimkins changes guidelines from 0-20 carbs to 10-20 carbs and 0-3 cups to 2-3 cups List 1? Then again, I’m stuck with what to do when you’re not hungry. Forced eating sounds ED to me. I’ll find someone I trust to make a Recommended Supplements list. While eating disorders may begin with preoccupations with food and weight, they are most often about much more than food. Eating disorders are complex conditions that arise from a combination of long-standing behavioral, emotional, psychological, interpersonal, and social factors. Scientists and researchers are still learning about the underlying causes of these emotionally and physically damaging conditions. We do know, however, about some of the general issues that can contribute to the development of eating disorders. People with eating disorders often use food and the control of food in an attempt to compensate for feelings and emotions that may otherwise seem over-whelming. For some, dieting, binging, and purging may begin as a way to cope with painful emotions and to feel in control of one’s life, but ultimately, these behaviors will damage a person’s physical and emotional health, self-esteem, and sense of competence and control. ED are behaviors. It’s not about the food or the calories. It is all about your thinking. Heidi and her minions all preach that nothing tastes as good as thin feels. That in itself is an ED. Period. If we make changes it will be announced with the Maintenance Plan (which will be a work in progress from member feedback). The announcement will be general and not in response to any outside pressure. At least in this aspect Heidi has been true to her word. The maintenance plan is still ongoing with her asking members for advice. She couldn’t come up with a maintenance plan on her own, so she is having members do it for her. Color me shocked…. She couldn’t even come up with a diet of her own, so she stole Stillman’s. For reckless disregard of everything and everyone that stands between her and a fast buck, Consumerama hereby force-feeds Kimmer and her company this week’s NMRoM Award! Don’t it just kinda get you right here…..
With Kimmer a tad busy, it seems members are jumping in to offer advice to each other. This might be a good thing if the starvation concepts advanced by Kimmer didn’t seep down deep into those following the diet. After someone suggested a public fitday to review, the member complied, and sure enough, other members were at the ready to give advice. Guess what advice they received? You use a lot of cream – this might satisfy your coffee with cream in the morning – it does mine! Please review the veggies you’re eating with the Kimkins Grocery list. When I started I counted the carbs and stayed under 20 per day – I now stay under 10 per day. The plan works – now you have to work the plan. I’m not Kimmer either but and no where near my goal but your veggies are too high. You can only have 2 cups of the list one and 1 cup of list two or 3 cups of list one. You show you’ve gone over on most days. Also, no regular creamer if that’s the kind you’re using. Drizz has good advice too. Also, there were a couple of days you didn’t list…..so not sure if you went over on those days or just didn’t write stuff down. Beef also stalls me terribly, which is a shame because I love beef and can only tolerate the rest of the choice. If you go back to the food list and really follow it, I think you’ll find you’ll do just great. Please hang in there, you are so worth it! Notice no one said anything about the erratic and very low calorie intake? With a five day calorie average hovering around 500 calories, the problem is too many vegetables and cream, even though this member is remaining within the 20 grams of carbohydrate supposedly allowed on the diet? Yes, what we see here is the trickle down theory of Kimkins weight loss advice. Sad isn’t it. Yet this is still the practice over at Kimkins. You know, I think I have a better title for this post. 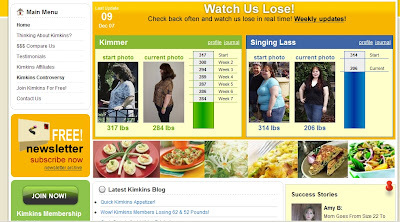 Imagine my surprise last night when I checked out the Kimkins website for the last time in 2007, only to discover that Heidi Diaz/Kimmer has a new picture up!Now, before you go to her site and raise her hit ranking on the web, which is not a good thing, above is her most recent weight-loss picture for your viewing pleasure. What I find most amazing in viewing her latest picture is not only the amount of weight she alleges she has lost doing her own Kimkins starvation diet, but her penchant for the color red. First of all, the lovely Lesya, the woman from the Russian bride website whose picture Heidi Diaz/Kimmer scoffed to represent her “after” picture on the Kimkins website. Not a good choice, Heidi. You know, Heidi, every time I see another picture of you, I see RED. How can you, in all good conscience, continue to lure unsuspecting people desperate to lose weight to your website in the hope that they will pay big bucks to you to learn how to literally starve themselves by following your deadly Kimkins diet? How?